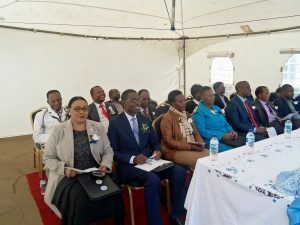 United Bulawayo Hospitals launched the Advanced Orthopaedic and Ophthalmic Post Basic Nursing Schools on the 13th July 2013 under the following themes “A strong bone, a productive nation” and a “A seeing eye, a healthy nation” respectively. Student nurses and other qualified nurses marched from Milton High School near Ascot Sopping Centre holding banners with messages on the launch of the two programs. On the site were external exhibitors Council for the Blind, National Social Security and New Avakash. Local exhibitors comprised Physiotherapy and Occupational Therapy department as well as Orthopaedic Centre. The event was graced by high ranking dignitaries. The Guest Speaker was the Regional Manager for POSB Mr. S.T. Chasekwa who delivered a powerful speech. Some of the speakers were the Chief Executive Officer for United Bulawayo Hospitals Mrs N.V. Ndlovu, Dr. Magava and Principal Tutor for United Bulawayo Hospitals Mrs J. Ndabazokufa. Mr. B. Sithole, a Lecturer at United College of Education gave a touching emotional speech which chronicled his encounter with medical outreach team which was screening for eye problems and resulting in the identification of his failing eyesight during his childhood. Another vibrant motivational speech was from one of the Advanced Orthopaedic Nursing student Sr L.C. Chukukwa. She encouraged other qualified nurses to take up the challenge and enrol into post basic programmes such as these ones. She also motivated all her colleagues to persevere despite challenges they may be encountering during their training.